My rationale tells this couldn’t be true, but my hope for awesomeness overrides it. 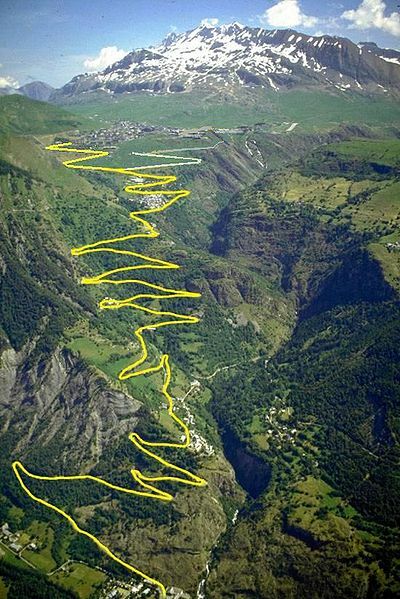 A rumor has just surfaced in France and Belgium, stating that next year’s TdF could FINISH on the 21 switchbacks of Alpe d’Huez. The Tour has ended on the Champs Elysées for the past 37 years, most of them completely ceremonial (but not all), and before that I think it was one of two velodromes in Paris for the other 62 years. So, a finish anywhere else would be a little special, I’d say. As for this new rumor being completely out of left field, it’s not really. It has already been widely reported that there would be two ascents of the Alpe next year, most assuming they would be in the same stage. Perhaps that was the red herring in this mystery. Imagine a Tour de France that really isn’t over till the last stage, and especially one that ends with a mountain stage. It completely turns the race upside down (usually there is a decisive time trial near the end). Contador must be salivating over his churros right now, if the rumor has hit Spain yet. I know, it’s just a rumor, but a man can dream, can’t he? This entry was posted in Tour de France and tagged tour de france 2013 alpe d'huez finish. Bookmark the permalink. It would be even more limiting than usual as to the shape and size of the potential tour winner. Not being built like a whippet myself, I gaze in awe at that different race of men who can cycle uphill at speed but I admire the dedication and nerve of the points winners just as much. Me, too, TP. However, it all depends on how they balanced the Alpe stage with time trials and ‘punchy’ stages, for example. Tour design must be either a great art or a hard science, but it’s extremely intriguing to me, either. From the look of next year’s Tour so far, I think it’s going to be one for a great all-rounder (very light in the Pyrenees, for example). At least I hope that’s the case. You know why this excites me? Because what I miss more than anything in the TDF is the mountain time trial! Remember those? Maybe they are thinking of a TT up Alpe d’Huez? Regardless, any stage on Alpe d’Huez is awesome, and to have a finish that isn’t that silly ceremonial thing would be fantastic. I was thinking the same thing. It wouldn’t be the first time finishing with an ITT and it would add even more to the potential drama.